"Meltdown Green" A set of 13 cake beads with a pine green base and decorated with dark rose dots and swirls. The beads measure about 10-12 mm each. This is the only set of these beads. They need a new home! Price: $7.00. "Meltdown2" A set of 10 cake beads with 2 black spacer beads. The beads measure about 8-10 mm. each. Price: $7.00 for the set of 12 beads. This is the only set in stock. Shades of blue and green. 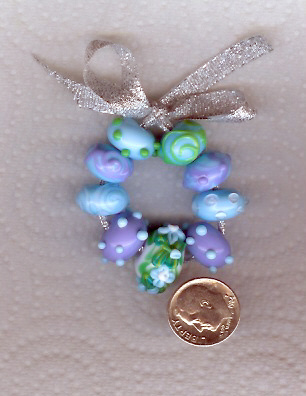 The "Garden" focal bead has sky blue flowers with pink centers. Sizes range from 7 mm to 18 mm. Price: SALE: $10.00 for the set. This is the only set. "Meltdown4" Black base color with lemon yellow swirls. Again, another test set. The beads measure about 12mm each. This is the only set. Price: $7.00 for 10 beads. "Meltdown4A" A set of 10 black base beads with flattened lemon yellow dots. Some of dots didn't turn out well. Each bead measures about 12mm each. My test gone awry is your gain! This is the only set in stock. PRICE: $7.00 for 10 beads. "Greys" Light grey and dark grey base colors. Random colors decorate the beads. Each bead measures about 10-14mm, This is the only set. PRICE: $7.00 for 11 beads.